Trump’s address to the UN highlighted his narrow-minded, transactional approach to diplomacy. He may have been speaking at the United Nations, but the emphasis was clearly on the second word—nations—rather than the ties that bind those independent countries. A look at President Trump’s UN diplomacy, Iranian President Hassan Rouhani addresses the General Assembly, Syria’s war end game generates discussion, and the UN tries to make progress on a global migrant compact. Foreign Minister Nikos Kotzias discusses Greece's political and economic challenges in the Eastern Mediterranean region, as well as energy issues, the Cyprus dispute, and developments in the Balkans. 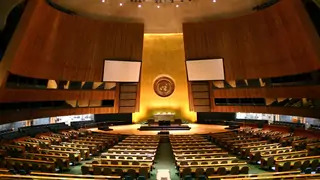 Stewart M. Patrick, senior fellow in global governance and director of the International Institutions and Global Governance (IIGG) Program at the Council on Foreign Relations, joins James M. Lindsay to discuss the impact of the United Nations General Assembly. Trump has revealed himself to be a man resistant to compromise, with few qualms about going it alone when he doesn’t get his way. For the leaders gathering for the UN General Assembly this week, the question hanging in the air is simple: Is that all there is to American diplomacy?